Pesach is my favorite Jewish holiday. The traditions are so rich and the Seder is the ultimate joyous, jubilant Jewish celebration: the symbols of the Seder plate, the smells and tastes of real Jewish food (I will put Margie’s golden chicken soup up against any in the world), the struggle with matzoh for eight days, the four cups, the laughter, the singing, Elijah. Those are all so memorable. But it is the message that permeates the holiday that is so important. While the book of Exodus holds perhaps more of the basic concepts, precepts, commandments and narratives of the Torah than any other book, the Haggadah‘s lessons seem much narrower. Every Jewish holiday harks back to a connection with bedrock stories from the Jewish community’s past like the recitation of the Akedah and story of Jonah on the High Holidays, the Megillah on Purim, Akadmut and Ruth on Shavuot,, or the rededication of the Temple at Hanukkah. But the Seder and the Haggadah ask something of us that is wholly unique and of an entirely different nature than any other Jewish holiday. It specifically tells us that we must place ourselves inside the story – we must be in Egypt to feel the pain and oppression – and the redemption. This is one of the main lessons of the telling of the story of the Four Sons, which acts as an answer to Mah Nishtanah – Why is this night different from all other nights? 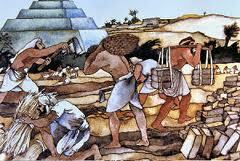 So why is it so important to more than sympathize, more than empathize, but to actually experience being slaves in Egypt? The answer seems straightforward. Each of us needs to understand what it is like to be oppressed so that we will never become oppressors ourselves. We must feel the weariness of the excruciating labor, the pain of the task masters’ whips, and shed the tears of a people without rights or freedom. Having lived through it ourselves, it should be unthinkable for Jews to oppress others. And lest we forget, we are commanded to relive our slavery each and every Pesah. We must understand the pain of the oppressed and the evil of the oppressor – so that we never allow the roles to be reversed. Alan Dershowitz’ Impassioned Speech Calling Out the U.N. for Its Pro-Palestinian Bias In No Uncertain Terms. What Do You Think? In this speech, Prof. Dershowitz very convincingly asks how the U.N. can dare to say that it has any moral authority since as far back as 1975 it has done virtually nothing for oppressed people of the world like the Cambodians under Pol Pot, the Rwandans, the Chechens, etc. because they have been preoccupied with discussing Israeli human rights violations. Further, he points out that it is ludicrous to say that a vote to admit the Palestinians is in support of the two-state solution because a large number of the voting countries do not recognize Israel as a legitimate state. So, they are really only supporting a one state solution – Palestine. He then goes on to talk about the rights of Arabs in Israel, the great medical and other scientific devices that Israel has given the world, and the very effective counter-terrorism methods which have become the state of the art. The following is the email trail between my friend and myself. I have eliminated the identifying names and the chronological order has been set in reading order so that the earliest posts are first, but otherwise, the debate is verbatim. A. Is my correspondent correct? Did I “reject it all”, or did I give Dershowitz his due and refute him where appropriate? B. Do you agree with Dershowitz’ argument? C. Do you agree with Dershowitz’ style and delivery? None of you will suspect me to be a Zionist or a pro State of Israel’s policy. But you all must listen to this profound words of the no. 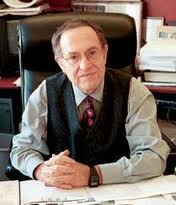 1 supporter of Israel, the fame Alan Dershowitz, and I am very serious.Listen to him. Go to this link. Although I do not support the policy of Israel these days, I do think that Dershowitz’s speech to which you can listen on this link is really impressive and has a lot in it. Although Dershowitz makes some excellent points, I find him to be one of the most arrogant, one-sided and sometimes hypocritical apologists for Israel. He has become a caricature of his early pro-Israel self and he has lost all credibility with me. There is no doubt that the UN continues to be an extremely anti-Israel body – I personally do not believe that it should be condemned wholesale as many on the right here in the US do. I believe that it is a flawed organization – but still accomplishes much good in the world. I was very surprised to hear his claim that Fayad is asking for multiple times the land area for acceding to 1) Jewish Quarter, 2) Route to Hebrew U. and , 3)Western Wall. I have NOT heard that anywhere else. As a matter of fact, it was my understanding that in several of the previous proposals, Israel offered less land. This is the type of claim that causes me to question the veracity of everything he says. Look, he claims that Fayad told him this face-to-face, so I guess I have to believe him. However, as with most political statements, one really needs to know the context in which a statement is made – so as to make sure that it was not in some way taken out of context. Actually, the impression I got from the tone of Dershowitz’ rant was that he is damn pissed off that the Palestinians are making a very smart political move by going to the UN. Finally, I don’t if you are aware that Pajamas Media (PJTV) is a predominately right-wing media outlook that – similar to MEMRI and CAMERA – will rarely, if ever, publish anything that criticizes Israel. While they claim to ‘set the record straight’ and ‘counter the left-wing media’ and do translate/publish some very interesting information – they are so one-sided that in my mind, they have very little credibility. Camera in particular looks for anti-Semitism and anti-Israel bias everywhere – and in my mind often stretch the truth in doing so. Also, the Hudson Institute is a right-wing think tank in DC – and very partisan. Anyhow, thanks for forwarding this. I am a big believer in listening to all points of view. Anything that you say about Dershowitz or the media that you mention is right. However, you do not address his main points! It is incredible to hear about the fact that the UN did not deal with Cambodia and at that time they were condemning Israel. It is amazing to realize that they never deal with what Turkey or Syria are doing while at the same time they are voting against Israel permanently. And so on and so on… I will not go again into the arguments that he brings. Most of the things he says are right! I am sorry to say that in your arguments you sound one sided also. You know that I do not agree with the politics of our government, but I am also tired of everybody (especially the British) blindly supporting the Palestinians only without really understanding the problem in depth. First, I didn’t address those issues because I have not had time to research whether he is totally correct or not. He may well be – but I don’t take what virtually anybody says without fact checking. Plus, I am sorry but for me citing events (as tragic as they may be) that are 35 years old don’t support or refute where the UN is today – and what positive role they may play in the world. Finally, as my mom used to say, “two wrongs don’t make a right”. The fact that the UN is anti-Israel does not address whether or not anything is really accomplished by the Palestinians going to the UN. I personally don’t believe that Abbas went to the UN because he thought that somehow magically this would “create” the State of Palestine. I think that he went because the peace talks are at a standstill and that he was trying to shake things up. It appears that he has. Bibi has agreed to come back to the negotiating table with no pre-conditions. I read that the Palestinians have rejected that – which makes me extremely angry at them – but perhaps that will change. I certainly hope that the two sides can at least start talking. Even if part of it is right, you should give it consideration. But you reject it all at once just because it is him and also because it is about Israel. He is on the extreme side and so are you in your response. However, I simply don’t agree with much of his assessment of why the Palestinians decided to go to the UN – but that opinion is not based on the fact Dershowitz’ delivery or how I feel about him personally, but simply that I don’t agree with his assessment of why they went (that is, his contention that they went because the UN is so pro-Palestinian and the Palestinians “occupy” the United Nations). Don’t get me wrong – yes, the UN is pro-Palestinian – I certainly believe that, and there are many, many examples of that. However, going to the UN was not their first resort – but rather a pretty late resort. That is, for example, Abbas has been in power since 2005 – and it is only now that he is going to the UN. Instead, he spent a considerable amount of time trying to reach agreement with Olmert and reports are that they were very, very close to an agreement. This seems to me to be a pretty strong argument against D’s contention that the Palestinians’ main reason for going to the UN was because of its advocacy in favor of the Palestinians to the detriment of all other oppressed minorities in the world. In addition, while I personally don’t believe that going to the UN per se, is going to solve anything – I think that it is a very smart, clever and non-violent tactic. Therefore, rather than ranting and raving (which you have to admit Dershowitz does), I think it behooves everyone – no matter whether they are on the right or the left – to calmly and intelligently analyze this significant change in tactics. I am personally extremely happy to see that the main stream Palestinian authorities seem to have rejected violence as a tactic. (There are glaring exceptions like their honoring suicide bombers, and the PA’s possible reconciliation with Hamas – (but so far, they have not been able to reconcile and presumably one of the issues is their point of view on violence and terrorism)). I still have a lot of history to learn, but it is my recollection that Arafat never rejected violence. As evidence that the current government has made tremendous strides in eliminating violence, one only has to look at the fact that the heads of Israeli security have indicated the great advances that the PA police forces have made. So much so that they were able to open up a significant number of checkpoints about two years ago. On a separate issue, I was about as disappointed with Abbas’ UN speech as I was with Dershowitz’ YouTube clip. Abbas basically reiterated all of the old Palestinian talking points about the Nakba, etc. Of particular note was his mentioning “63 years of occupation”. That goes back to 1948 so by implication he seemed to be denying Israel’s right to exist. What a step backwards. Pretty depressing for us two-staters. Further, he offered virtually no ‘olive branch’ that could be used as a way to bridge the gap. On the other hand, Bibi’s speech was masterful – as usual – and certainly went a long way to reaching out to the Palestinians. It’s a shame that Abbas didn’t call Bibi’s bluff – and agree to meet him the same day at the UN. Now that would have been the sign of a great leader. Further disheartening, the Palestinians also appear to have rejected the Quartet’s current negotiations to get everybody back to the table. My final word to you is simply that I hope I can convince you that I do my best to give all sides consideration. That is one of my core ideals. Like most ideals, one doesn’t always live up to them, but I certainly try to. President Obama delivered an aspirational and inspirational speech at the United Nations General Assembly this morning. It was a great piece of rhetoric. It reflected on the real change of the last year and called on the members to support continued progress in the areas of democracy, reigning in nuclear arms and climate change. However, it contained lots of cheer-leading and little substance, viz. The men and women who built this institution understood that peace is more than the absence of war. A lasting peace – for nations and individuals – depends upon a sense of justice and opportunity; of dignity and freedom. It depends upon struggle and sacrifice; on compromise, and a sense of common humanity. Unfortunately, when it came to Israel and Palestine, there was really very little of substance that he could offer. He reiterated the U.S. position that the Palestinians could not use the UN to gain legitimacy because peace could only come through direct negotiations by the parties. While this may be true – he offered no way out of the pending clash. Israelis must know that any agreement provides assurances for their security. Palestinians deserve to know the territorial basis of their state. I know that many are frustrated by the lack of progress. So am I. But the question isn’t the goal we seek – the question is how to reach it. And I am convinced that there is no short cut to the end of a conflict that has endured for decades. Peace will not come through statements and resolutions at the UN – if it were that easy, it would have been accomplished by now. Ultimately, it is Israelis and Palestinians who must live side by side. Ultimately, it is Israelis and Palestinians – not us – who must reach agreement on the issues that divide them: on borders and security; on refugees and Jerusalem. 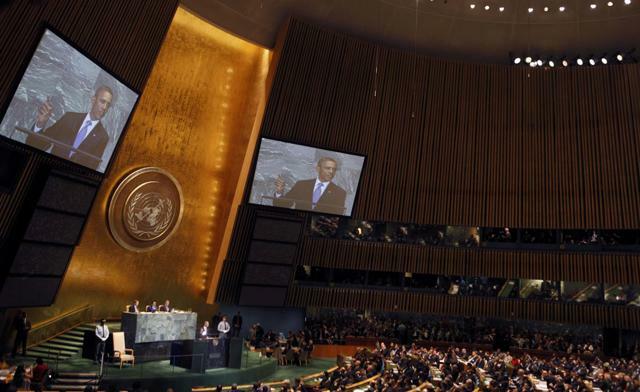 Full text of Obama’s speech to the UN General Assembly can be found here.